...everywhere you go." -- all 'round my house, anyway! Of course, when November opens with a snowstorm -- and when another happens two weeks later -- and then the temps drop below -20 C (-26 C with the Wind Chill)...I've been hunkered down with my kitties, and Christmas handwork has begun in earnest. One of my cousins "back East" is expecting his first grand-baby sometime in December, so a crib quilt is under construction. When I asked Grandma-to-be what colours Mom-and-Dad-to-be would like, she replied, "Well, S is rather fond of black. In fact, it took some persuading to keep her from wearing it to her wedding!" Ahem. Well. "So..." I replied, "How about black and white with a touch of red?" G-to-be smiled. Good! I turned to a favourite "old" (not vintage) pattern: Magic Tiles from Kathleen Bissett. 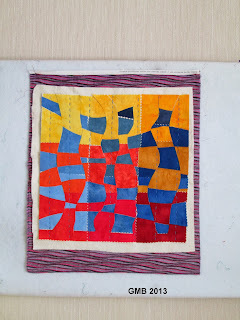 When I first began to quilt almost twenty years ago now (! ), this pattern was all the rage for a while. 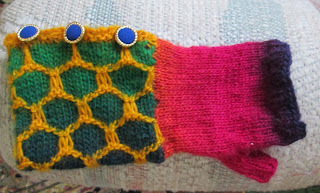 I believe it was the fore-runner of 'Stack 'n' Whack' and that sort of thing -- where you slice and dice your fabric and re-arrange it to come up with wonderful combinations of colour and shape. 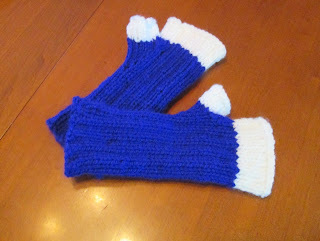 I made a good half-dozen of these, and it remains a staple in my pattern repertoire. This time I am making it a bit smaller -- nine blocks instead of twelve, and I haven't decided on a border yet. This is in part due to the fact that it's been a bit tougher to find enough variety in fabric -- and no, I didn't have much BW&R in my stash! I won't say any more that that, because some of the recipients actually read this blog! With all these starts, there have been a few finishes. 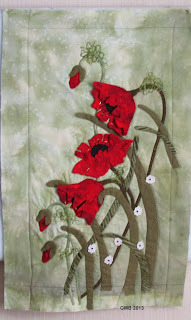 "Posh Poppies" goes in the mail today. 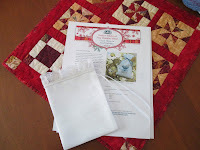 All three aprons for the Dec. 1 Open House and Tea at the Mirror & District Museum have been assembled; there's just a wee bit of hand-stitching to do at each waistband. And my 15" x 15" piece for the current theme, "Connected", needs just a bit of tacking at the edging, plus a label and sleeve. All will be revealed on that front at the deadline, November 30. 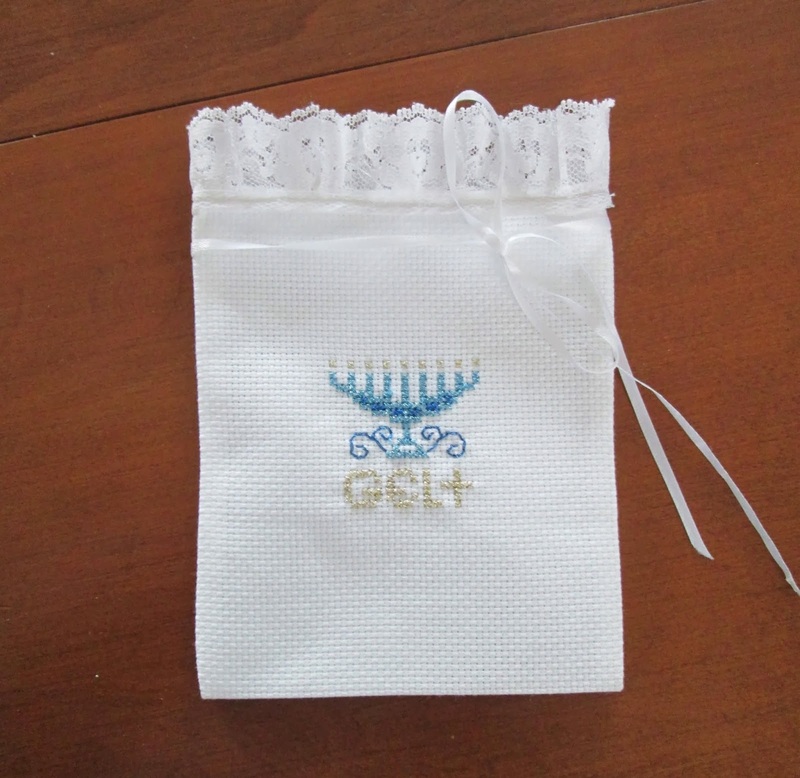 With Hanukkah just over a week away, I also managed to finish the wee "Gelt Bag" -- a free pattern from DMC, using their Metallics Light Effects floss. This floss is a bit tricky to work with, but as long as you keep the lengths short, you can tame it! The pattern calls for a pre-made bag, but not having time to mail order one (this is a shop sample and it's late as it is!) 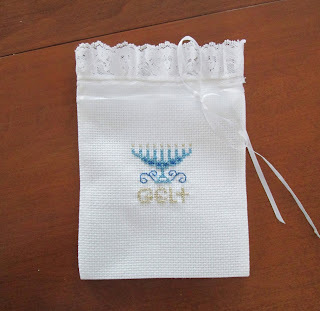 I made my own from 14-count Aida cloth, a wee it of lace and some ribbon. If I were to make another, I'd do the design before assembly, as it's rather a challenge to stitch with your hand inside a little sack! 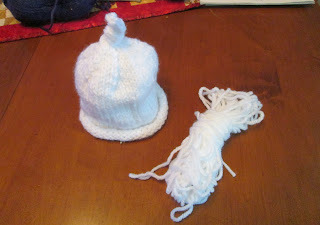 And this preemie-sized cap -- with still a bit of the white left over -- a "loaves and fishes" moment! And that's all my news for this WIP Wednesday. I'm hooking up with The Needle and Thread Network...and going off to finish those Magic Tiles blocks! 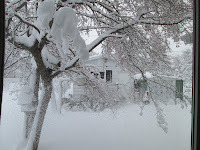 Your snow is so beautiful!! I really miss it living this far south. You are accomplishing so much!! 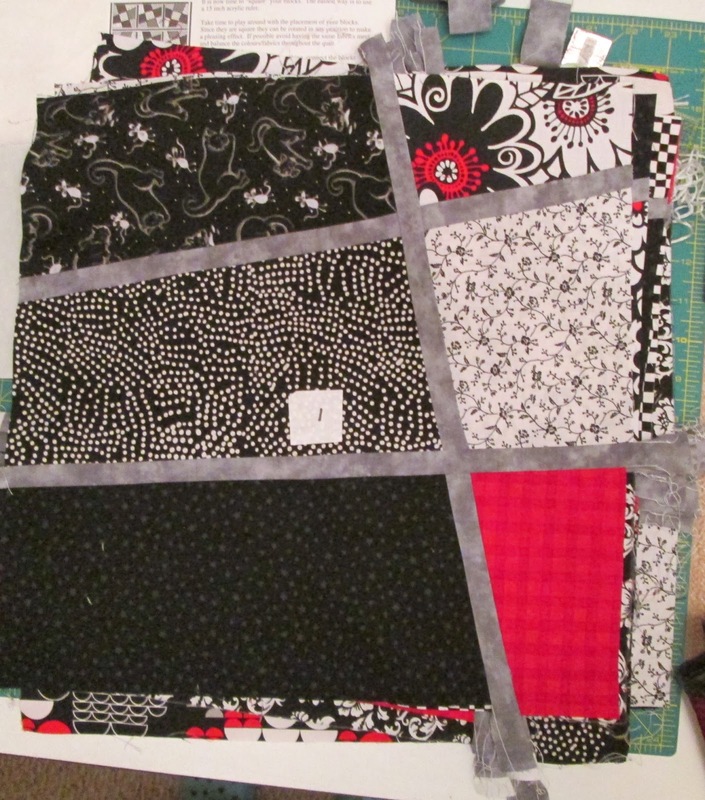 I wouldn't have picked black for a baby quilt but, why not? Your Magic Tiles is going to be perfect. Your Gelt Bag is lovely! Who needs store-bought? : ) And the preemie cap is adorable!! Wow - must be the right phase of the moon for finishing projects. 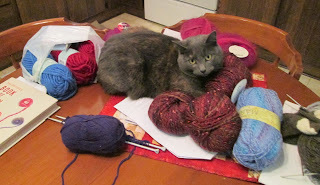 I too have given in to the urge to knit now the weather has turned colder. ohh,you ARE busy! I do like the magic tiles and have made a few with and without the leading. 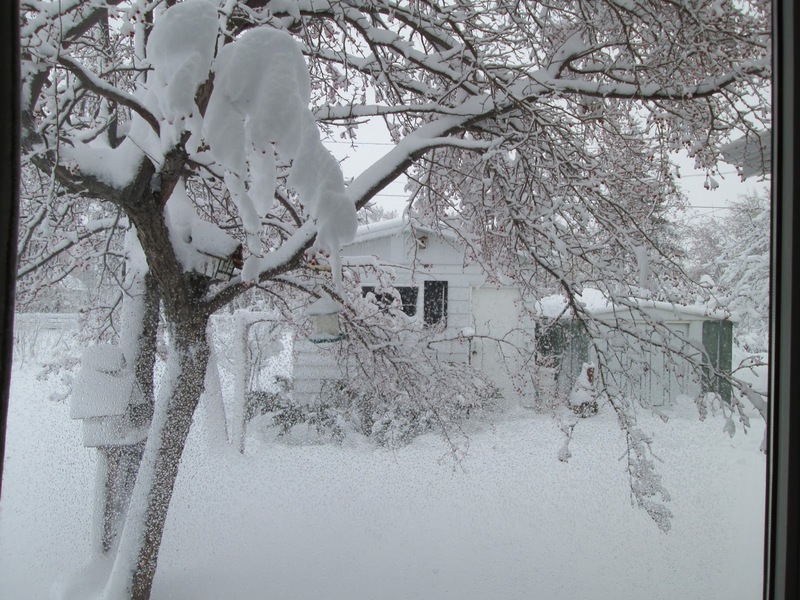 Snow here too but not so much. Your story about the mom-to-be loving black gave me a laugh. The store where I work carries Columbia fleece baby buntings each year and this year in addition to pink, blue, and various prints we also had black--for infants but people purchased them. A visit to your blog always gets me back into the studio doing something.